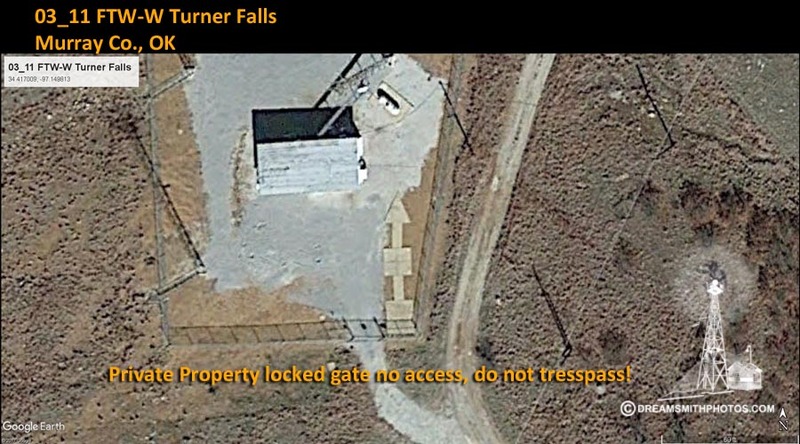 This site is now located with a lot of Microwave towers and is unaccessable due to locked gate. None yet, be the first. Giant Air Beacon- Ardmore, July 6._(AP) Government airway engineers have started construction of a 4,000,000 candlepower airplane beacon light on top of Timbered Hill, near Turner Falls, 18 miles north of here. It will be completed by July 15. The beacon, engineers said, would be the most powerful along the Fort Worth-Oklahoma City air mail line. A 36 inch lens will be mounted on a 75 foot tower. The hill is the highest point in the Arbuckle mountains. Several towers south of here on the air route have been erected and will be in operation about June 15. The station is located about 7.0 miles south-southwest of Davis and 7.0 miles north of SPRINGER on the summit of the most prominent hill in the Arbuckle Mountain Range. It is a large revolving light supported by a 4-legged steel structure and has an overall height of 40 feet. The point observed and traversed to was directly beneath the center of the light. To reach the station from the post office in Springer, go north on U.S. Highway 77 for 6.4 miles to a large gate on the left, turn left through gate and go west and north on main traveled road for 1.2 miles to the top of hill and station as described. Station recovery (2009) recovery note by geocaching 2009 (LPC) recovered in good condition.